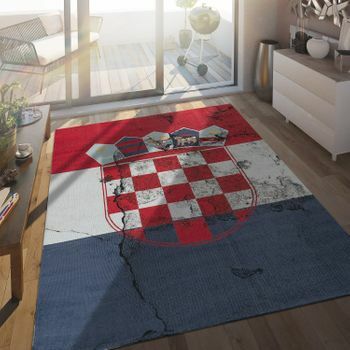 With a flag rug, you can get that big match feeling in your own home every day. Whether it's your country's flag, or the flag of another nation. 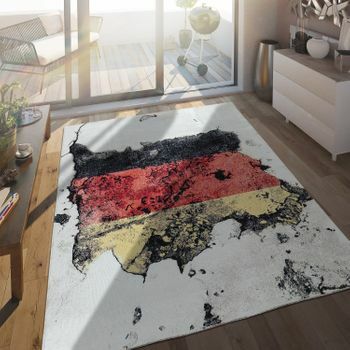 A national flag rug is perfect for anyone who wants to be reminded of their love of a particular culture or the wonderful experiences they had in a specific country. A national flag represents the unity, independence and autonomy of a nation. The design of a flag often reflects the character of a nation and its people in connection to historical events. So it's not unusual for this to include religious or political views. National flags are frequently used as positive symbols. Flags can be used to express a deep connection to a nation. Unfortunately, the opposite can also be true, such as when a flag is burned or desecrated. To prevent national flags being used negatively, countries have laws to ensure that flags are treated with respect. For example, there may be a law stating that flags must not touch the ground or stating the times at which a flag can be hoisted. Similarly, countries can determine when a flag needs to be replaced and, in particular, how an old flag can (or must) be disposed of. The United States of America has a Flag Code, which states that old flags must be burned in a dignified manner. If, on the other hand, the national flag of the United States of America is burned in protest, this constitutes inappropriate behaviour. However, the Supreme Court prohibits individual states from prosecuting an act of provocative flag burning as a criminal offence. Whereas other countries—such as Germany, for example—have completely banned the burning of the national flag. The Argentines have prohibited flags from being washed. For them, this would represent the blood of national heroes being washed away. In Argentina, old flags must be buried with honour. But where do flags come from? They date back to the time of chivalry. Back then, brave knights wore a distinctive symbol on their shields during combat or in tournaments. The coat of arms, which was part of this symbol, signified who the knight was fighting for in battle or who they represented during a tournament. This also meant that people were able to instantly recognise who was approaching them from a distance, and were either pleased to see the approaching knights or knew they would need to seek protection. With time, towns and settlements also adopted distinctive symbols, which developed into coats of arms and eventually into the national flags we know today. In the weaving process, the warp yarns (stretched lengthways in the loom) are split with some being lowered and some raised using suitable instruments. This creates an opening between the warp yarns, known as the shed. A shuttle carrying the weft thread moves through this shed. The alternate lifting and lowering of the warp yarns means these lie above and below the weft yarn, thereby creating a weave. This traditional process is still used by some manufacturers in small and large widths — and by using synthetic fibres you can achieve a completely new quality. This manufacturing process guarantees maximum comfort, but of course this comes at a price. From the origin of the flag during the fight for fame and glory, the importance of flags as a symbol of honour and loyalty to individual countries has developed continuously. This is where the German term for desertion, "Fahnenflucht" (literally "flag fleeing"), comes from and desertion is still considered a serious offence today. Even at an early stage, defending your own flag against a hostile invader was considered the most noble duty. Flags were considered holy, were sanctified by the church and were only to be worn by a select group of people. Flags represent a feeling of community and are a symbol of belonging, especially at sporting events, international gatherings or festivities, such as the football world cup. At such events, the flags of nations, teams and even individual organisations can be held high and revered. Flags can also be used for advertising or as room and building decorations. 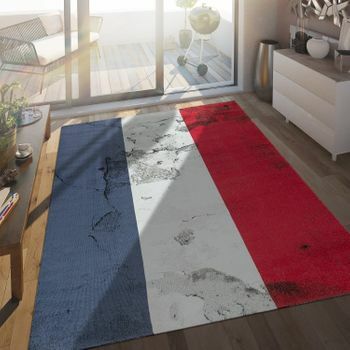 The great thing about the robust flag rugs from Rug24 is that you can have a flag in your home all year round. 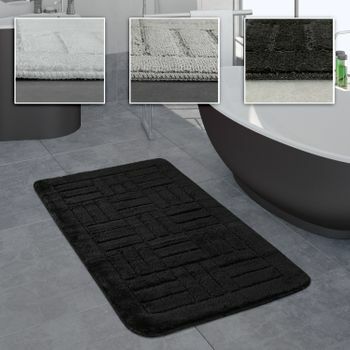 Thanks to the top-quality material, these rugs are suitable for both indoor and outdoor areas. 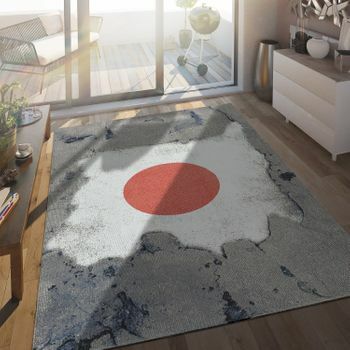 Thanks to the trendy designs, these rugs look just as good in a living room as they do on a terrace or balcony.